We have a situation here where a company that could not run successfully but has an idea (that is not fully cooked) wants to find a sucker county or city government organization to foot the bill for funding a recycling center, WITHOUT THEM HAVING ANY SKIN IN THE GAME. And amazingly, because Somervell County is so desperate for money (or at least SR2O thinks so), they are actually considering floating their boat to tune of millions of dollars, because Somervell County hopes to get in a revenue stream that is entirely dependent on the success of this nebulous, unproven business. So how the fool did this all start? Presumably with Darrell Best and his shadow, self-appointed economic development committee that decided to take $25,000 and get some guy named Wes Jurey out of Arlington to send a company out here for some of that free moolah. I suspect that Darrell, who has a horrible track record with running anything, was hoping to use this to burnish his credentials when he ran for Somervell County judge. We sure dodged a bullet with that one, since he didn't even make it into a runoff. (Remember the $80,000 Land of the Dinosaur debacle? Or him taking money from being head of the city economic develop board to give to others, ooops, i mean to his Chamber of Commerce org, that later went under? 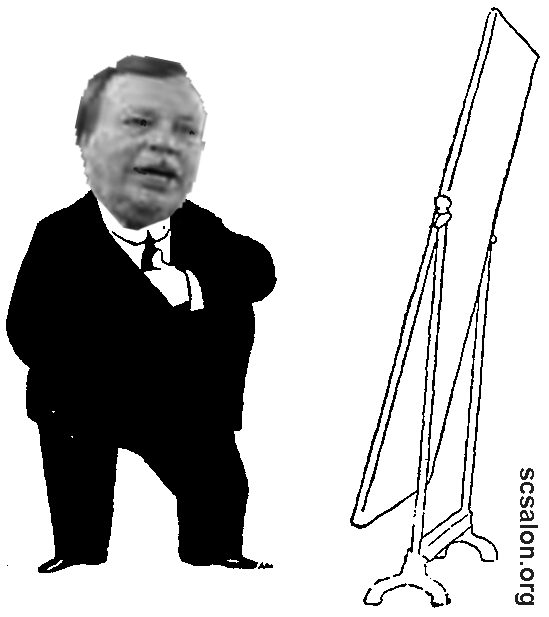 Anyway, next thing is that Mike *Where's my Mirror* Ford announces that Somervell County has a public private arrangement with "Center for Innovation", which is Jurey's company. And then Jurey sends along these guys from SR20 to come have a private meeting with the judge in his office (so cozy and away from the taxpaying public's prying eyes). Based on what was said to SR20, SR20 apparently decided to go find out about buying some land from a lady on 56, who thought it was good enough of an offer to be a *done deal* and was told to keep it quiet. This was all way before the public at large even heard about this rubber to oil business. But word will leak out, even when the Somervell County Commissioner's Court tries to keep it on the hush, and particularly some people who live up near the nuclear power plant and that land that the SR20 would be on found out and immediately had some environmental concerns. For me, I also am concerned about the environment but even more about why in the fool Somervell County wants to buy land, equipment, finance construction for this company and then lease it back to them, all without SR20 contributing a dime. For those who believe in small government and are Republicans pushing this, stop your hypocrisy and shut your mouth about ever talking about people on welfare ever again, because you have zero credibility. Or maybe you just don't give a hoot about helping hands for human beings but Making a Buck is your god. Geez, Somervell County has already done this with, let's count them, the Expo Center, the Amphitheatre, the Squaw Valley Golf Course, and the Glen Rose Medical Center hospital. Ie, Somervell County wants to own the land and lease out premises, and in the case of every single one of these businesses, the taxpayer has ended subsidizing the cost. Why is government in the business of running private industry? Maybe Somervell County truly is desperate, but it seems more to me that people like Mike Ford are shortsighted in how the county should be managed for best benefit (and I'm glad he's almost GONE where he can't do any more damage). So here' s the basic deal that was voted on, which according to ALL who voted on it, does NOT make it a done deal but only one that takes another step towards vetting the unholy circumstances of hands-out SR20. SR20 is a company that went under in Oklahoma, and has a plan that would mathematically enlarge its operations, but is unproven. This would be the FIRST place where the company is actually doing what they propose (and the plan is not fully finished). They have already tried to pitch this to Alvarado and Cleburne and were turned down. Meanwhile, after the executive session, the council returned to quiz SR2O executives. The answer from SR2O: The site could be used for any number of other manufacturing applications if they failed. The company has to make an applicaiton to the Texas Commission on Environmental Quality before the deal can proceed. Although one SR2O official on Monday said the company said it would file a permit application today, on Tuesday morning Clemons said he would stay his hand until he was sure he’d found a solid municipal partner. So they probably still haven't. What they want the county to do is form themselves as a public corporation that would have the ability to issue bonds, the bondholders would buy the bonds, and Somervell County would then use those millions of dollars to buy land and build infrastructure and get equipment for this specific purpose company. The bonds would be non-recourse revenue bonds where, because so much interest is being paid on the bonds, the bondholders would not be able to go after the county (or the board the county created) to recover monies. Thus, taxpayers have no skin in the game IN THIS REGARD. There would be a trustee (usually a bank) that would be the ones to handle the money, pay out interest to the bondholders, and keep reserve money on hand in case SR20 folded; presumably this would also be enough money to pay for insurance to clean up the property in case of an environmental disaster, but who knows? If the company folds, would Somervell County be on the hook at all? Why, yes. If there was an environmental situation and there wasn't enough money in reserves to clean it up, the taxpayers would undoubtedly get their tax money raised to make up for it. Then, assuming the bondholders, who would have first right to the property, didn't take it over, Somervell County would have a big ole white elephant in the same vein as the Amphitheatre, which is badly in need of repair and is single use. Think a company designed only for a particular tire process would lend itself well to another industry? I don't. I also question why, if the idea was really also pitched as a way to be locally environmentally friendly, to keep waste of the landfull, why Somervell County wouldn't go for a multi-use recycling plant that would benefit everybody. SR20 ONLY does recycling for tires compared to community recycling that would also include metal, paper etc. If one of the reasons to do this is keep things out of the landfill and the county is (foolishly) considering this type of action, then why the fool isn't it a multi-purpose recycling center? SR20, amazingly, said in the meeting this last monday, (full audio at that link) when asked why they didn't get private financing instead of coming on the dole from a county, said that were they to get private financing, they would be coming here asking for tax abatements AND FOR LAND TO BE DONATED TO THEM (I had to stop the audio at that point , lean my head back and laugh right after SR20 asked if Somervell had land they wanted donated). What a crazy world, where business believe that a community is obligated to bribe them to come in return for not having to pay taxes, or getting donated land, or in this case, going into a huge bond deal for a company with no credit. Maybe Somervell truly is desperate but that problem can be laid squarely at the feet of Mike Ford, who should have seen this coming-EFH has been talking bankruptcy for years now and, even without that, has naturally been paying less property taxes each year). When the commissioners voted to create the public facility corporation, at least one of them didn't know why he did it. AND they apparently rushed this document through to such an extent that it contains some serious errors. John Curtis told me he didn't understand what the purpose of the board was and that he would get back to me (he hasn't), even though the document was right there in Monday's agenda packet. Notice that this was so sloppy that there is a difference between them calling themselves the Paluxy PFC and something called "Dinosaur Valley PFC". (Would like to know who was in charge of this document)- I'm willing to bet that makes this document illegal. 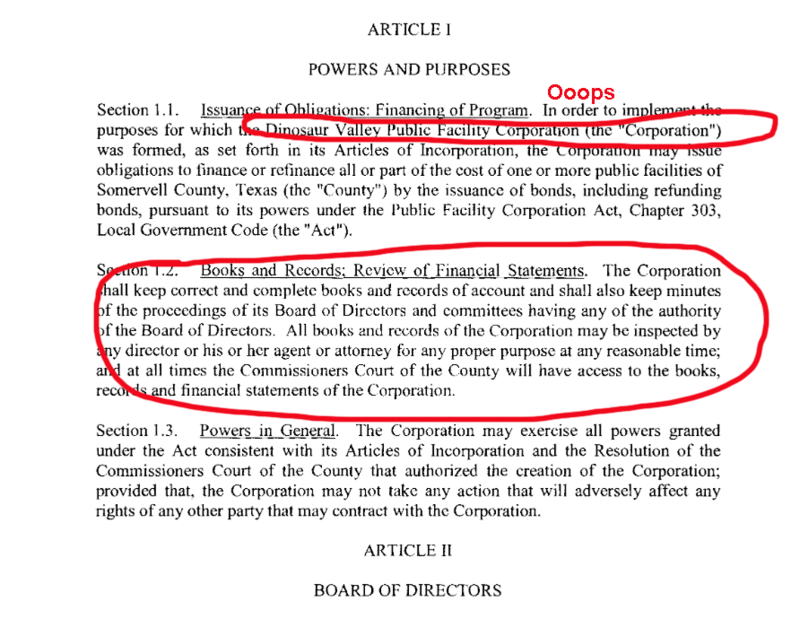 Second, notice that, even though this is a PUBLIC CORPORATION That reports to the county, they think they can specify who gets to the see the financials. Baloney. Now, Darrell Best may have been able to stop people from seeing the Land of the Dinosaurs financials, because that was a private company and he refused to even get a report from them about how the city's money was doing, you know, that 80 thousand dollars in the deal the auditor thought was illegal) but that does NOT apply to this. Guess what, citizens get to know what their government is doing at all times. 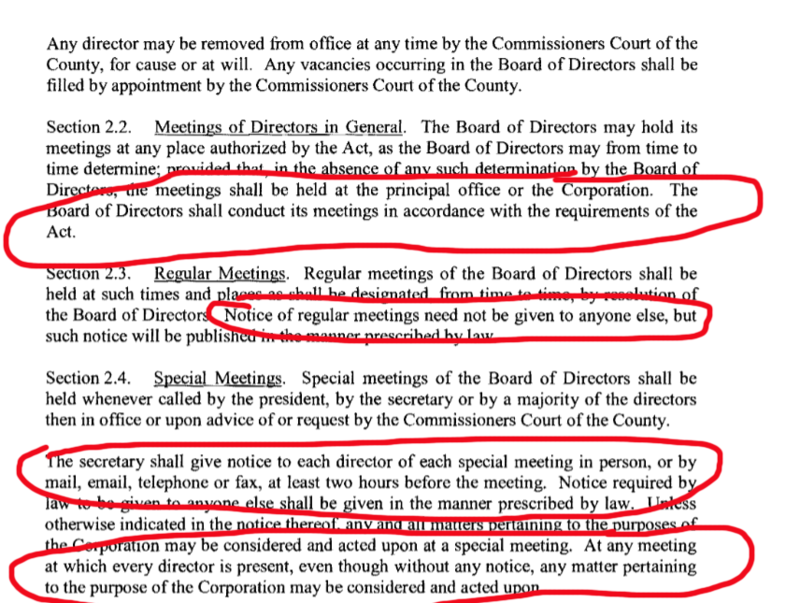 Also, note what this ridiculous little document says on the next page-that they get to call their meetings on the fly and don't have to follow the TOMA (Texas Open Meetings Act). Oh, yes, they do, and any member of the public can attend. I don't like the fact that even one commissioner voted to create this public corporation, even under the excuse that it gives them a way to keep this business out of the county commissioners court. The ONLY time this should be approved is IF the commissioners intend to foist this mess on Somervell County, it's like they can't seem to be able to vet the process UNLESS they form this entity? I'ts just crap, it's there probably on the behest of Mike Ford moving this forward and to pat SR20 on the head. Note that there must be a mandated IRS TEFRA hearing before these guys can vote to do all this bond business. Reason is that the IRS says you can't give public money for a private entity without either a referendum or a public hearing. I suggest that hundreds of citizens who are against them MAKE SURE to show up when that TEFRA hearing gets scheduled and tell them no way. Bring a tissue for Mike Ford, or at least a beer for him to cry in if they vote against it or maybe he would prefer to privately boo-hoo in his golf vehicle at Pecan Plantation where he just moved. P.S. My own rule of thumb if it was my money would be to ask if I would personally invest in a company with a poor track record and pie in the sky PR. Unless I was a multi-millionnaire with money to lose, the answer would be no. Tell 'em it only took about 20 min. to find those and that there are plenty more pages of information out there, all you got to do is look for it. Somebody need to compare the amount of water usage vs. the amount of water intake from the Paluxy to replace their usage. The process of pyrolysis creates residues including char, silica (sand), and ash. Some of these residues may be reused (if approved by an environmental agency) while others must be disposed of in a landfill. The amount of residual waste produced is about 15–20 percent of the overall [plastics] feedstock used in the process. Litter, odor, traffic, noise, and dust must also be assessed and will vary according to the differences in facility technology, size, and feedstock. Well, that about sums it up, except Mike Clemons told me in a private meeting on 03/06/2014 that he already had the money (financial backers, Trane, Ingersol Rand) to build this plant, he also told me that Alverado was begging them to come there. If Goodyear Tire couldn't make a tire pyrolisis plant work, what makes anyone else think SR2O can work ? Check it out yourself---don't take my word for it. It's right on the internet free for the reader! @White Buff- If he has the money and those investors believe it's a great concern, then that's the direction he should go instead of asking the county to go into business for this shaky enterprise. But, oh, then he'd expect Somervell County to cough up free land for him. Ugh. Goodyear, end product sells, explosions ( very volital environment inside reactor. When cooling off vacuum was broken , air mixed with gases and BOOM ! ), etc. Very , very informative --- unbiased , just the facts. ( no bull ). ! The second problem with the economics of tire pyrolysis proposals is that they assume plant operating costs typical of those in the petroleum industry. These are not even remotely applicable because the scale of operations is entirely different. Consider first, as we have shown previously, that used tires must be used close to the point of origin because of high transportation costs. In an urban metropolitan area having a population of two million, we might expect a similar number of used tires annually. If these used tires could be collected and delivered to the local pyrolysis plant, this would indicate a daily usage of 5,500 passenger tires. If we estimate that these used tires might generate 5 lb of oil per tire, we are talking about 27,000 gal. of oil per day, or less than 1,000 petroleum barrels per day. This figure is below the size of most pilot plant operations in an oil refinery and can hardly achieve petroleum production economics. To put this in perspective, if 6 gal. of petroleum are needed to make one tire, then 500 gal. of gasoline are required to wear out that tire, assuming we are talking about a 50,000-mile tire and a 25-mpg vehicle. It is difficult to conceive of a location other than Metropolitan New York that could support an efficient pyrolysis plant in terms of the huge volume of tires required. Additionally, a tire pyrolysis operation would have to be run with all of the safety precautions required in an oil refinery and presumably would have to be operated on an around-the-clock basis. A well-engineered pyrolysis operation in Struthers, Ohio,blew up during a Sunday shutdown and was never reopened. The plant in question was built in 1982 by newly formed Carbon Oil and Gas in Struthers, Ohio, a suburb of Youngstown, on the site of a vacant steel-making plant. One of the founders, Morris O. Hill, the president and chief executive officer, was a well-qualified petroleum engineer with 27 years of experience at Standard Oil Company. A total of $3.5 million was invested over seven months to build the plant, which laid claim to being “this nation’s first economically viable tire recycling and resource recovery system.” The plant was designed to produce 7,500 gal. of oil per day. On start-up operation on January 6, 1983, the plant delivered 143 barrels of #6 oil to a broker. They encountered some problems in cooling the hot carbon char before dis-charge into open air and still lacked an OSHA clearance when, during a temporary shutdown on a Sunday morning, an explosion demolished the reactor. Presumably on cooling, air leaked back into the reactor and encountered hot petroleum gas, a constant risk in any petroleum refinery. The plant was never repaired nor reopened. I sure wish these people would be sworn in under oath when making these promises.